When it comes to outdoor pursuits, Ray Yeary is more than a weekend warrior. A lifelong backpacker and adventure sports enthusiast, Ray has been able to take on increasingly more strenuous activities thanks to the comprehensive care he's received at Mayo's Sports Medicine Clinic. Hiking and being outdoors are passions for Ray Yeary. He loves pushing his body and taking on new physical challenges. But that level of activity over many years can take a toll. For Ray, it resulted in chronic pain in his left knee, which made going down a mountain especially difficult. But Mayo Clinic Sports Medicine has helped Ray keep pursuing his passions. 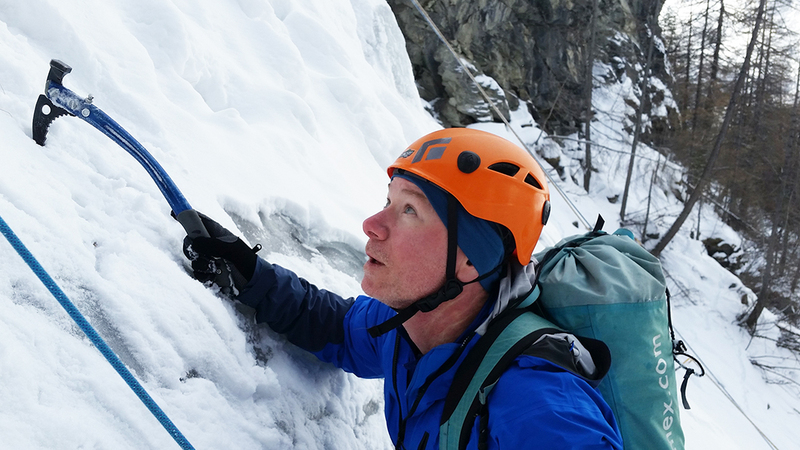 Just three months after regenerative therapy to heal an inflamed tendon in his left knee, Ray was able to strike out on his biggest sporting adventure to date: ice climbing in the Italian Alps. Based out of a ski resort in France, Ray camped for a week and climbed to 12,000 feet, doing multi-pitch ice climbs. "It's awesome to climb up above the clouds. I was climbing straight up these cliffs and putting all my weight on my knees," says Ray. "My knee is way better than it was before. The pain is gone." Ray has been tackling tough physical challenges for a long time. Fifteen years ago, the information technology executive and his son set a goal of hiking the 2,200-mile Appalachian Trail, which runs from Georgia to Maine. "Hiking offered an opportunity to clear my mind from my high-pressure desk job," Ray says. "We started out doing 150 miles a year, and it turned into much more than just a bonding experience. This became a huge goal that really changed the way I live my life, especially my nutrition and exercise habits." 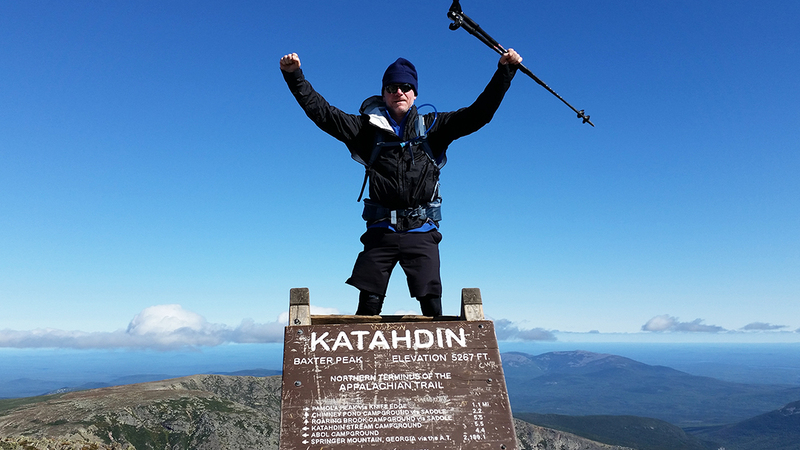 "[Dr. Maynard] helped me get my diet right and develop an exercise regimen that would allow me to push my body to the higher limits that are necessary to complete the Appalachian Trail." That goal and Ray's desire to have optimal physical fitness to achieve it brought him to Mayo Clinic's Florida campus five years ago to see family and sports medicine physician Jennifer Maynard, M.D. Dr. Maynard is one of a team of physicians that are part of the Sports Medicine Clinic. "She helped me get my diet right and develop an exercise regimen that would allow me to push my body to the higher limits that are necessary to complete the Appalachian Trail," Ray says. "But the trail really takes its toll on the body. I have chronic tendon issues." In 2017, Ray was 165 miles from the end of the trail in Maine when he slid and hyperextended his legs. He had to hike 18 miles to the nearest town after the injury. A subsequent consult with Dr. Maynard and an MRI revealed Ray has torn his right quad tendon, and it required surgery. Ray not only faced the possibility of not being able to complete the milestone he'd pursued for 15 years, his ability to continue hiking and engage in adventure sports was in jeopardy. Ray was referred to Mayo Clinic orthopedic surgeon Matthew Crowe, M.D., another member of the Sports Medicine Clinic team, who scheduled the surgery for October 2017. The procedure involved drilling holes thorough the kneecap to suture the tendon to the patella. Dr. Crowe also removed a bone spur caused by the inflammation of the tendon. Ray spent eight weeks in a brace before beginning a strict rehabilitation protocol that involved cautious restrengthening of his quadriceps, with a goal of being able to hike again six months after surgery. At the six-month mark, Ray hiked in the Adirondacks. In September 2018, he reached the top of Mt. Katahdin at the end of the Appalachian Trail. "I felt like I was going to cry when I got to the top," Ray says. "I started to get all these ideas of what I was going to do next. I needed something to work toward and decided take up ice climbing." The only thing that stood in his way was chronic pain in his left knee. Prior to the quad tendon repair surgery, Ray had relied heavily on his right leg to get him through the toughest parts of hikes. But with that knee still healing, he'd been putting a lot of pressure on his left knee, and the pain was persistent. Knowing he wanted to go ice climbing in the Alps, Ray went to see James Presley, M.D., another Mayo Sports Medicine specialist. "We did an MRI and an ultrasound, which revealed there was a large calcium deposit in the distal tendon at the insertion of the kneecap," Dr. Presley says. "I could see the areas of the tendon that were most irritated and causing the pain." Dr. Presley put Ray on an exercise program to build strength and encourage the tendon to heal on its own. He and Ray also discussed doing a procedure known as needle tenotomy, followed by a platelet-rich plasma injection, if the exercises didn't get rid of Ray's pain. Performed with a local anesthetic, the procedure involves using a needle to create channels through the abnormal areas of the tendon and then injecting platelet-rich plasma through those channels to work on the tissues. "Platelets are filled with growth factors, and when they're released in an area of injury, they increase the body's ability to heal," Dr. Presley says. After several months of being on the exercise routine, Ray's pain persisted. He wanted to move forward with the regenerative procedure, but the timing had to be right. Dr. Presley, Dr. Maynard and Dr. Crowe worked together to develop a timeline that would enable Ray to go ice climbing. "We had to plan the timing between Dr. Crowe's post-surgery rehab protocol for Ray's right knee to give that knee enough time to heal in advance of the procedure on the left knee, which would require a minimum of eight weeks, and ideally 12 weeks, to rehab," Dr. Presley says. Ray underwent the regenerative therapy procedure in September 2018 after he returned from completing the Appalachian Trail. For the first two weeks afterward, he couldn't put full weight on his left knee, and he needed to use crutches. He then began a rehabilitation program that involved a series of exercises to gradually increase the tendon's strength. At a follow-up appointment three weeks before his trip to France, Dr. Presley told Ray his knee was healed and strong enough for the trip. "He did a very good job of listening to his body and gradually increasing things," Dr. Presley says. "He followed his rehab protocol perfectly, and that worked beautifully for him." "The doctors all have a sports mindset. It feels like they're on my side and want to keep me going." "When I got back from the Alps, my left knee felt better than it had in years," says Ray, who's now preparing for a trip to climb Mt. Rainier in June and another to Ecuador in November for a volcano climb. "If I want to keep doing these sports at a high level, I have to really take care of my body. It feels like I have a team at Mayo Clinic's Sports Medicine Clinic, starting with Dr. Maynard. She managed my overall health and is now working with me on altitude preparation," Ray says. "Her relationship with the other doctors in the program and how they all communicate is wonderful. The doctors all have a sports mindset. It feels like they're on my side and want to keep me going." Learn more about platelet-rich plasma treatment. Read about Mayo Clinic Sports Medicine.